It has been a busy few weeks at Providence Care as our first phase of early movers officially moved into the new Providence Care Hospital. Staff from various departments including Redevelopment, Communications, Operational Readiness, Food and Nutrition Services, Housekeeping and Information Management and Technology all made the move this month. The library at Mental Health Services including books and shelving units also made the move. 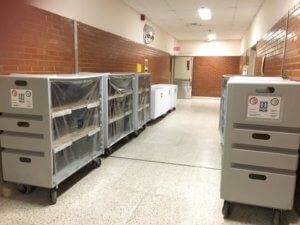 These support services have moved over early in order to prepare and install equipment and trial and test the various new spaces. Staff have been working diligently to ensure everything is prepared and safe for occupancy. The early move wouldn’t have been possible without Health Care Relocations (HCR). Providence Care has teamed up with this professional company who has supported over 400 health care facilities in successful transitions for over 20 years. HCR arrived at Mental Health Services on January 31 to deliver the equipment necessary to safely move office items. Staff were able to pack in advance of this date and had boxes ready to go. On February 1, HCR was back picking everything up to transport over to Providence Care Hospital. Within less than 24 hours, all departments involved in the early move were set up and working in their new spaces at Providence Care Hospital. Health Care Relocations did a phenomenal job in ensuring this process was smooth and they accommodated a few last minute requests as well. Information Management and Technology (IM&T) played a key role in this early move as they were responsible for safely packing IT equipment and setting up over 40 computers and printers once HCR had delivered everything. Thank you to the entire team who helped get this done, it was no easy task and required a lot of planning and coordination. Lindsay Thompson, a Communications Officer with Providence Care was one of the early movers and she was impressed with how easy the moving process was. “I was a bit worried at first seeing all of my things packed up in boxes waiting to go. I wasn’t sure what to expect, but there was minimal disruption and I am excited to be set up in my bright new office space,” said Lindsay. The next and final phase of the move will be from April 7 to April 23 with a break in between for Easter. Patients and clients will be making the move on April 23. A mock move will occur in March (one at St. Mary’s of the Lake Hospital and one at Mental Health Services) in order to test the logistics of the move plan and ensure the safety of our patients and clients on move day. The schedule has been created and produced down to exact minutes, so this will be an opportunity to test out access points, validate timing and elevator travel. It is hard to believe everyone will be in their new spaces at Providence Care Hospital in less than 60 days.